through it from the warm air mass above. If the temperature is below 0°C, icing may occur; but generally it is light (view A of fig. 4-43). The shallow slope of an unstable stationary front results in a very broad and extensive area of showers, fog, and reduced visibility. 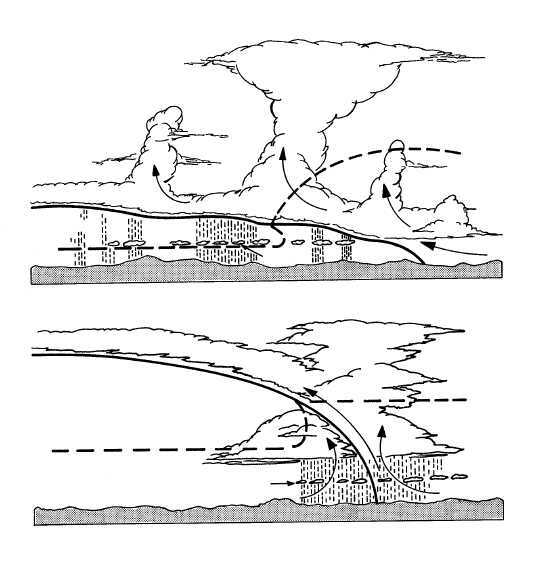 If the slope of an unstable stationary front is steep and sufficient warm air is advected up the slope or the front moves slowly toward the warm air mass, violent weather can result (view B of fig. 4-43). Heavy rain, severe thunderstorms, strong winds, and tornadoes are often associated with this front. The width of the band of precipitation and low ceilings vary from 50 miles to about 200 miles, depending upon the slope of the front and the temperatures of the air masses. One of the most annoying characteristics of a stationary front is that it may greatly hamper and delay air operations by persisting in the area for several days. REVIEW QUESTIONS Q4-18. When a quasi-stationary front moves, if it does, what is the normal speed? Q4-19. What type of weather is normally associated with an unstable stationary front? MODIFICATIONS OF FRONTS LEARNING OBJECTIVE: Describe how fronts are modified by their movement, orographic features, and underlying surfaces. The typical fronts we have just covered can and do undergo modifications that strengthen or weaken them. Such things as frontal movement, orographic effects, and the type of surface the fronts encounter contribute to the modification of fronts. 4-45 SCATTERED THUNDERSTORMS COLD AIR A. SHALLOW STATIONARY FRONT 0 C O AG5f0443 WARM AIR TOWERING CUMULUS STRATOCUMULUS 0 C O SCUD LINE SQUALL ALTOCUMULUS STRATUS OR STRATOCUMULUS COLD AIR WARM AIR 0 C O 0 C O SCUD B. STEEP STATIONARY FRONT Figure 4-43.Types of unstable stationary fronts.